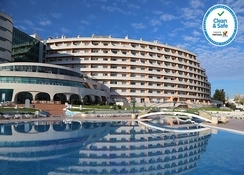 Paraiso De Albufeira is a family-friendly hotel, nestled in one of the most privileged areas in Albufeira, Portugal. What sets this hotel apart from the rest is its contemporary architecture, ingenious designs and glamorous woods. The hotel comprises 396 apartments available in Studio and One Bedroom Apartments to meet the needs of solo travelers, couples, families and group of friends alike – equipped with a living room, balcony, kitchenette and bathroom. There are plenty of leisure areas available for guests to unwind in, surrounded by lush green gardens. In addition to this, you will find a large outdoor swimming pool surrounded by sun loungers – ideal for those who like to sunbathe. 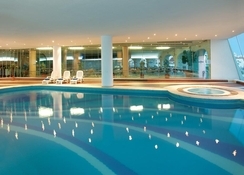 Other facilities and activities within the hotel include a jacuzzi, mini golf, health club, tennis, multipurpose field, mini club, live music, games room, shops, hair dresser and more. The hotel’s delectable dining scene includes no less than seven hotels and bars, so guests are sure to stay satisfied day and night. Paraiso De Albufeira enjoys a fabulous location in R. do Município, 8200-161 Albufeira, Portugal. It will be an exciting time for beach lovers, as the Fisherman’s beach is within 1km from the resort. In addition to this, there are numerous shopping malls, sport clubs, restaurants and bars within close proximity to the hotel. The Faro Airport is about 44.8km away from the hotel. The apartments in the hotel are comfortable, airy and cosy. They are available in different styles to match the tastes and requirements of different guests. All the rooms are contemporarily designed, and they reflect traditional furnishings of the local region. The Studio and One Bedroom Apartments comprise all the necessary amenities including a kitchenette, balcony, bedrooms with an additional balcony, well-equipped bathroom, flat screen TV, telephone, in-room service and much more. 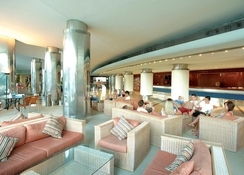 There are plenty of bars and restaurant in the hotel which serve both local and International delicacies. Restaurant Eva, Restaurant MGE, Self Service Aquario, Snack Bar Patio Caribe, Bar Adao, Bar Giro and Glam Club are all available in-house for guests to drink and dine in. Or, why not take advantage of the in-room food and beverage service to make yourself comfortable in your room? 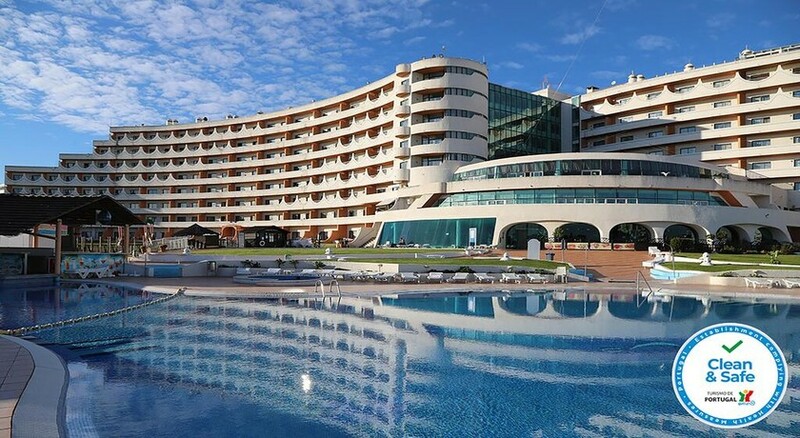 The Paraiso De Albufeira makes sure to spoil its guests with a range of activities and facilities that include wellness centres, sports courts and various entertainment hubs. Soak up the sun, while taking a relaxing swim in the outdoor swimming pool. Evenings can be spent relaxing at any of the bars, which display entertainment shows or live music for th enjoyment of guests. 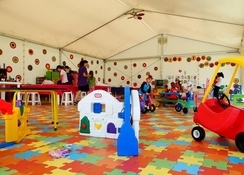 All of these facilities make this hotel a fantastic place to stay and make your family holidays memorable. Please Note : We inform you that the hotel reserves the right to request a payment of a security deposit of 100€ per person upon arrival, that will be refunded upon check-out after verifying that the apartment has not suffered any damage. The security deposit can be paid either in cash or by charging the amount on a valid credit or debit card. This deposit is valid for all type of bookings (individual bookings or groups). Could not fault the hotel and area will go back again. Myself and my guests thoroughly enjoyed what has proved to be one of the best experiences of my life so far! I loved the place and loved the accommodation. The hotel was amazing, 5-star quality for sure and the services provided like bar evenings, entertainment, taxi pick-ups, customer treatment and reception were faultless. Would definitely re-live this experience and be looking to book again in the near future. A well presented hotel, friendly staff, comfy bed, spacious apartment. Everything we needed for a great price. We will be back! What sells this hotel is the pool area. It's a really nice pool with a bar, and there are several things going on throughout the day. The entertainment wasn't good if I'm honest, but Al Buferia is easily within walking distance, a train stops close by to take you about town for a couple of euros. In. Oth the old and new town there are plenty of eating and drinking places, your spoils for choice. The beach is beautiful, with some water sports for people who are interested. The food was good, but after a couple of days you just want a change. We went all inclusive, but my husband hated the fact they would only trust us with small glasses of beer. We enjoyed our stay, and would go back. The gym is not free.